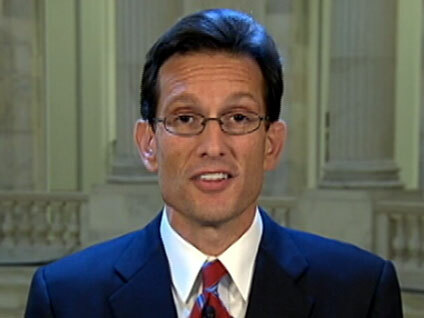 Eric Cantor: Repeal Health Care "Right Away"
Current House Minority Whip Eric Cantor, R-Va., is expected to be the new majority leader in the House with Ohio Rep. John Boehner as speaker. Following the news that the Republicans will take control of the House, Cantor spoke with CBS Evening News Anchor Katie Couric about his agenda when his party takes control of the House in January 2011. Couric asked first about the fate of health care reform. "I know in the Republicans' Pledge to America repealing health care is a major step on the agenda. How exactly do you propose to do that?" she asked. "Well you know, tonight's election is about listening to the people, and that was the message that's being sent across this land is they don't like this health care bill, and they want to see us focus on jobs, and there's just been no results that match the expectations of the people," Cantor said. "So I believe that when we take majority of in January, I hope that we're able to put a repeal bill on the floor right away because that's what the American people want. They understand that this bill is going to bankrupt this country and take away the health care that they -- most people in this country -- know and like. "The problem is, Katie, we haven't focused on the problem, which is the cost," he continued. "It's too expensive. Health care is just, the costs are out of control, and we've got to go back and begin to give the American people what they want, which is lower cost and higher quality. Not this abomination that was passed." Couric asked Cantor about the CBS News exit polling showing that 48 percentof the people wanted to repeal health care but 47 percent wanted to leave it as is or in fact expand it. "This is hardly a mandate [to repeal the health care bill] if you listen to our exit polls," she said. "I just saw the polling that you just showed. It said that 80 percent of Republicans are for repeal and independents are for repeal," Cantor said. "The majority of Americans saying, 'Start over, we don't like the status quo,' and we've got to get costs down and give people a choice and start accentuating the doctor-patient relationship and get government out of the business of deciding the proper care. That's what Republicans are going to be about, Katie. That's what the American people are saying tonight. You know what? This administration's had 20 months, and all the promises that have been made about the most important issue, which is the economy, have been broken, and they are fed up, and they have a reason to be fed up." Cantor didn't specifically respond to Couric's statement that in the exit poll voters were nearly equally divided on the health care bill. He referenced an earlier poll in which of the 47 percent of respondents who said they wanted to see health care reform overturned 79 percent said they planned to vote Republican in the election. Seventy-five percent of those who said the law should remain in place planned to vote for Democrats. It still remains an issue that falls along party lines. Couric then asked Cantor about what his party would cut per its pledge to reduce $100 billion in discretionary spending, not including the military or entitlement items. Cantor talked about fiscal discipline, job creation and capital investment but didn't identify any spending cuts in his response. "We have put on the table an attempt to put discretionary spending back to 2008 levels, and that means an across-the-board reduction in spending," Cantor said. "If you think about it, Katie, in 2008 the sun rose and set, and we're saying, let's get back to pre-stimulus levels. Let's get back to some fiscal discipline. That's a first step that we can start and bring down the kind of spending that has occurred in Washington. But you know, listen. The American people, they know that they can go about creating jobs. The small-business people are waiting for a signal from Washington that they're going to stop making it more difficult to put capital to work. That's what tonight is about too, Katie. It's about the fact that people are looking at Washington and saying, 'Don't you hear me? We want opportunity. We like success. Stop maligning those who are successful.'" CBS News Chief Washington Correspondent Bob Schieffer believes that the Republicans will have a tough time repealing the health care bill. "If the House can find some way to pass something to repeal health care, the president will veto it if it passes the Senate, and it will take more votes to repeal health care than it took to pass it, so that's going to be a very tall order," he said. "I think they're going to put spending bills on the floor once a week for the first 12 weeks of this administration. That's what John Boehner told me they're going to do. And if they hear what people are saying to them tonight, people want to work on the economy. That's what is the overriding thing that bothers people."